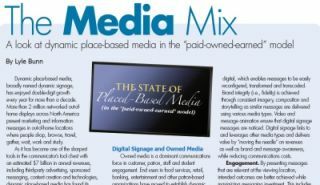 Dynamic place-based media, broadly named dynamic signage, has enjoyed double-digit growth every year for more than a decade. More than 2 million networked out-of-home displays across North America present marketing and information messages in out-of-home locations where people shop, browse, travel, gather, wait, work and study. As it has become one of the sharpest tools in the communicator’s tool chest with an estimated $7 billion in annual revenues, including third-party advertising, sponsored messaging, content creation and technologies, dynamic place-based media has found its place in the communications continuum and in the paid-owned-earned media model as a proven contributor to brand, conversion, communications and engagement goals. Paid media is the mainstay of the marketing industrial complex as brands and their agencies buy audiences (i.e., eyeballs and exposures) to generate awareness of products, services and brands, and point-of-purchase traffic. According to the 2010 Arbitron Digital Video Display Study, 70 percent of teen and adult U.S. residents, an estimated 181 million people, view digital video displays monthly. Operating within the communications continuum, many marketers are increasingly using their owned communications devices—such as their website, newsletters, on-premises and building signage, mobile app and dynamic signage—to achieve their branding, merchandising and re-visit goals. Owned media builds loyalty and activates conversion while fueling earned media such as opt-in, referrals, positive word of mouth, “likes” and other social media benefits. Owned media is a dominant communications force in customer, patron, staff and student engagement. End users in food services, retail, banking, entertainment and other patron-based organizations have moved to establish dynamic signage networks as part of their owned media and communications infrastructure. Omni-channel, 360-degree marketing seeks to reach a target audience at multiple points during their day. The 400-plus ad-based, digital place-based networks operating in North America provide advertisers with messaging to attract an audience of many, specifically consumers in out-of-home locations as they go about their day. Seventy percent of Americans shop multi-channel, including in-store, online and mobile. Retailers and brands are responding with a shift from transactional to experiential marketing, while assuring maximum fidelity-consistent brand messaging. The paradigm shift is occurring from multi-channel to omni-channel engagement, which reflects the melding of the engagement experience between the retailer/brand and the consumer. Transmedia, the re-use and re-purposing of brand assets across many messaging approaches, is driven by the economies of digital, which enables messages to be easily reconfigured, transformed and transcoded. Brand integrity (i.e., fidelity) is achieved through consistent imagery, composition and story-telling as similar messages are delivered using various media types. Video and message animation ensure that digital signage messages are noticed. Digital signage links to and leverages other media types and delivers value by “moving the needle” on revenues as well as brand and message awareness, while reducing communications costs. Engagement. By presenting messages that are relevant at the viewing location, intended outcomes are better achieved while maximizing messaging investment. This includes retail conversion, generating action and the motivation for “audience of one” engagement on mobile devices through opt-in, downloads, QR code capture, accessing applications, mobile browsing and mobile commerce. Analytics and consumer insights are achieved in numerous ways including anonymous viewer analytics, links to unique URL, QR codes, near field communications and opt-in through dynamic media messages. Dynamic signage as owned media is undergoing a surge in application driven by declining technology costs and complexity, and its proven use as a branding, promotion, merchandising and information device that can easily accommodate message changes based on daypart, audience, external factors such as weather and internal factors such as inventory levels and demand. Digital displays owned by retailers are used on premises to achieve branding, merchandising, upsell and cross-sell while improving the location visit experience and motivating earned media. In recognition that the medium works well when properly applied, end-user executives are increasingly charging their staff and advertising agencies with integrating dynamic place-based media into their plans, campaigns and their services. Retailers that are operating or planning showcase locations are tapping into a wide range of digital display technologies to benefit from a wow factor, increase destination traffic and generate public relations profile, while also experimenting and generating shopper insights on approaches that could be broadly applied for higher return on communications investment. Digital place-based media supports marketing and communications goals at each point in the paid-owned-earned media model providing high return and high leverage on marketing communications investment. According to a Deloitte retail industry survey, 71 percent of retail executives say shoppers want a meaningful experience with the sales associate as brand ambassador with strong product knowledge and the ability to upsell and cross-sell for greater customer satisfaction and loyalty. Many retailers speak of the need to improve their advertising plans to shift media buying investment away from “renting eyeballs” and into owning audiences. In keynote addresses at the National Retail Federation annual conference executives from Ralph Lauren as well as Bonnie Brooks, CEO of The Bay, reinforce the priority of shifting to brand demand messaging from brand awareness involving more experiential and social media. Digital in-store media bridges bricks—the physical environment, “clicks”—online information and commerce, and picks—consumer selection and its influencers. It also turns presence into engagement.